Daniel Fast – Organic or Not? Most of us increase the amount of fresh produce in our diets during the Daniel Fast. That’s good in some respects, but we also want to be wise about the foods we are buying. More and more consumers are buying “organic” produce because of all the pesticides used in large commercial farms. The cost of organic produce is usually higher, although I’ve found some sales on organic foods recently and there were less expensive than the commercial grades. A useful source for information about food safety is the Environmental Working Group. Its Web site lists 44 fruits and vegetables ranked by the amount of pesticide residue each contains. By knowing which fruits and vegetables usually carry the most pesticides and which are cleanest, you can decide when it would be wisest to buy organic. For those who are able to purchase only organic foods, then that’s great. I try to do that when I can, I especially try to purchase organic produce that can’t be peeled before consuming such as grapes, lettuce, broccoli, etc. However, organic food is usually more expensive and many people can’t afford it. Also, if we were required to have no chemicals whatsoever, that could be carried out to a level that most of us couldn’t comply with. So, those who teach about the Daniel Fast agree that “added” chemicals are what we should avoid and not consume . . . and thus people read the labels and study the ingredients on regular foods so they can follow the fasting guidelines. I hope this helps, Be Blessed! What if you cannot afford to purchase organic foods? Yes, light frying such as stir fry, with a quality oil is allowed on the fast. Be Blessed! I know on the fast you can not eat deep fried foods. But, can you slice up potatoes and cook them in a skillet in olive or canola oil with some onion? Yes, steamed vegetables are great on the fast! Cereal options would be: Muesli, also for boxed cereals are the Ezekiel brands and some varieties of Shredded Wheat, ex: http://www.arrowheadmills.com/product/shredded-wheat-cereal Also, there are several others found in the Natural Foods section of grocery stores or at Health Food stores, and then there is always good Old Fashioned Oatmeal. Bread is not allowed on the fast due mainly to leavening agents (yeast, baking powder/soda) not being allowed on the fast. Look for Ezekiel brand whole grain Tortillas or whole grain Flat bread, or you can make your own flat bread. Yes, we encourage supplements that are free of sweeteners and man-made chemicals. Be Blessed! Can steamable vegetables like corn, green beans,and broccoli be eatin on the fast? And are there specific cereals and breads/ tortillas that can be eatin on this fast as well???? Also is it okay to take one a day vitamins or hair,nails, and skin supplements? Yes, you can eat veggie burgers, however it’s hard to find prepared veggie burgers without sweeteners and/or egg whites, etc. included in the ingredient. Many of those on the Daniel Fast make their own veggie burgers. 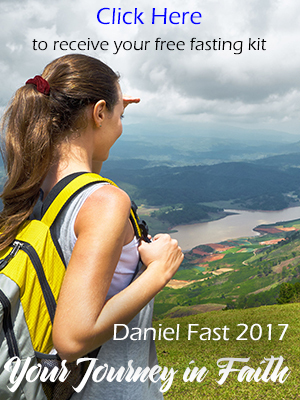 You can find recipes in the Daniel Fast Cookbook – Version II. Visit http://www.Daniel-Fast.com Be Blessed on your Fast! You just did! Welcome to the Daniel Fast Blog, what’s on your mind? Yes, avocodos are a great food for the Daniel Fast. Washing fruits and and vegetables will only get the outside clean,washing will not wash away the chemicals that has seep in to the pores of the food. Can we not wash the fruits and vegetables ?